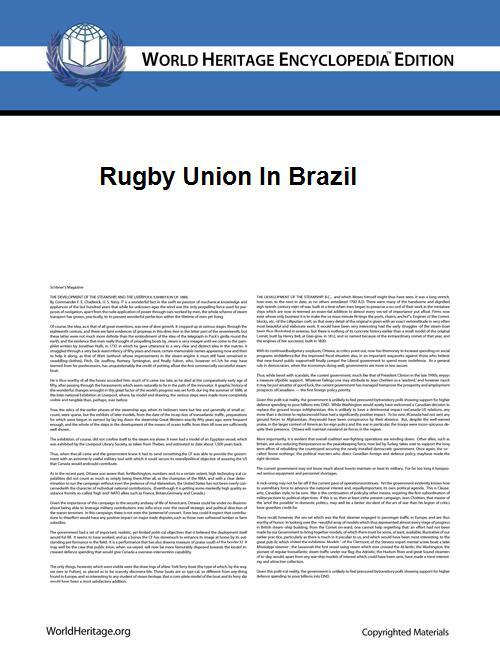 Rugby union in Brazil is a minor but growing sport, with rugby union increasing in popularity at universities across Brazil. 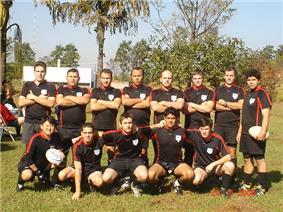 Rugby union is played regularly in all of Brazil's 26 states and in the Federal District. The sport is not widely played in schools, but is common in universities, more specifically the South, South East as well as parts of Amazon and the North East. The South East usually supplies the largest number of players to the national side. 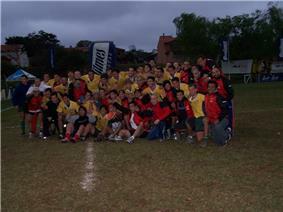 Over 16,000 people play rugby in Brazil. Brazil also competes in the South American tournaments sevens. The women's national team is the strongest in South America, and finished in 10th place at the 2009 Rugby Sevens World Cup in Dubai. Rugby union is administered by the Brazilian Rugby Confederation (Confederação Brasileira de Rugby, or CBRu). CBRu is sponsored by Topper. Rugby appears to have been brought to Brazil by British immigrants in the late nineteenth century. The first recorded Brazilian club was founded in 1891, in Rio de Janeiro. In 1891 rugby was introduced in São Paulo Athletic Club. The first recorded match took place in 1926 between São Paulo and Santos city representatives. The game narrowly missed out being recognised as a national sport by the government, because it was played in four provinces, rather than the required five. The large size of the country, plus the lack of infrastructure in many parts has hindered development of the game, and it remains mainly centred on the east coast. During the 70s and 80s, because Brazil was not part of the IRFB, a number of teams from South Africa toured Brazil, due to the apartheid era boycott. Brazil has also been visited by at least two French tours - that of 1974 and that of 1985. In 1988, rugby was being played in only three of twenty three Brazilian states. However, some progress had been made - in 1963, it was recorded that 95% of Brazilian players were foreigners, and there were only four clubs; by 1988, 75% of Brazilian rugby players were native born, and there were thirty five clubs. On October 9, 2009, the International Olympic Committee announced that rugby sevens would be part of the 2016 Summer Olympics which will be held in Rio de Janeiro. The national team have been playing international matches since the 1950s but have yet to qualify for the Rugby World Cup. The Brazil national rugby union team won five South American Championship B and is now playing the South American Championship A. The Brazil national team are generally ranked around 30th in the world, and have been ranked as the 3rd best South American team since they passed Paraguary in the world rankings in 2008. The women's national rugby sevens team is the best in South America, and has won all the sevens championships ever played, without losing a single match. The domestic club competition is the Campeonato Brasileiro de Rugby, or Super 10, which has been contested annually since 1964. The only way to watch rugby union in Brazil is through paid subscriptions, but the vast majority of Brazilians don't have paid TV, resulting in the sport being fairly unknown by the majority of the population. The first rugby union matches shown in Brazil was on ESPN during the 1999 Rugby World Cup (only highlights). The 2003 Rugby World Cup was the first live broadcast in the country by ESPN, thanks to the ABR efforts to make the IRB send the signal freely to the country. In 2007 Rugby World Cup ESPN got the 2nd place in audience with the paid channels, having a great coverage of the event sending reporters to France. In 2011 Pan American Games Rede Record (open air TV) broadcast some Brazilian matches of rugby sevens. Nowadays the Rugby Champions Cup, Super Rugby, Aviva Premiership and Six Nations is transmitted by ESPN and the IRB Sevens World Series is transmitted by BandSports. Brazilians can also watch the France national rugby union team in the Six Nations and Top14, French Club Domestic League by the French channel TV5MONDE.